Eating fruits somehow always makes me nostalgic. Every season, after every meal, we would sit around my mother while she meticulously peeled and chopped the fruits for us. Summer were often more labor-some for her as she sliced oranges and watermelons for a family of six. 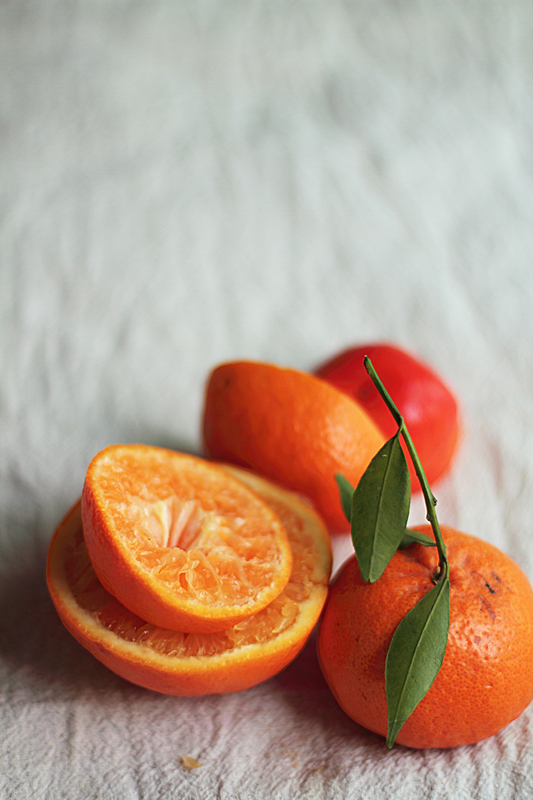 In winters though, we each would be handed a custard apple, clementine or tangerine right after the meal. Even now, my house is never without a box full of clementine during this season. As much as I enjoy just peeling and popping the whole fruit in my mouth as I did growing up, I have been meaning to make a clementine dessert forever. Not always fond of fruit in dessert, this has been prolonged way too long. Years may be? It's also obvious that for us, desserts often involve chocolate. But the idea of citrus with chocolate has often made us both think of it as a ridiculous insult to the pure and rich flavor of chocolate even without ever trying it. Until that is, we got invited to a dinner party where the host's chocolate clementine cake became the highlight of the meal and M has been raving about it ever since. Even though I enjoyed the cake as much as others, adding the clementine juice to the mousse made me feel like I was cheating, cheating on chocolate that is. Eventually, I took a deep breath and made the decision it was time to move on. And I'm so glad I did. This mousse is as easy as it gets and really hits the spot with the balance of citrus and chocolate without any adulteration from cream or eggs. You certainly need to be a chocolate lover as its rich and intense. 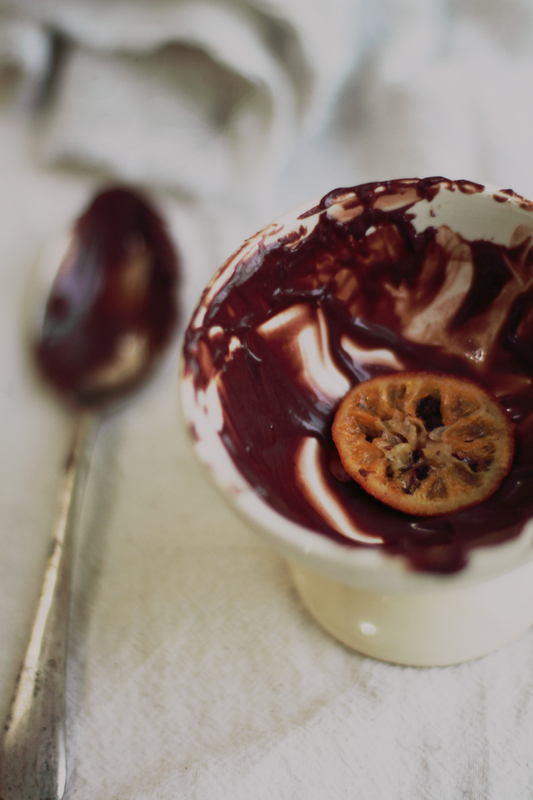 You must also like a combination of citrus with chocolate to enjoy this. For others, I would create a layer of fresh clementine slices, topped with the mousse, some whipped cream and candied clementine. Take a large mixing bowl and place it on top of another slightly smaller one that is filled with ice and cold water. Put chocolate, clementine juice and sugar in a pan and melt over medium heat. Once melted, pour the melted chocolate in the large mixing bowl and whisk until its thick. I suggest using a electrical whisker. Also, the mixture doesn't get as thick as I thought it would but once it starts to set it gets really mousse like. You don't want to over whisk the mixture too as it can get grainy that way. Divide into two serving cups. I like to let it sit in the fridge for 15 -30 minutes but it can be served instantly as well. 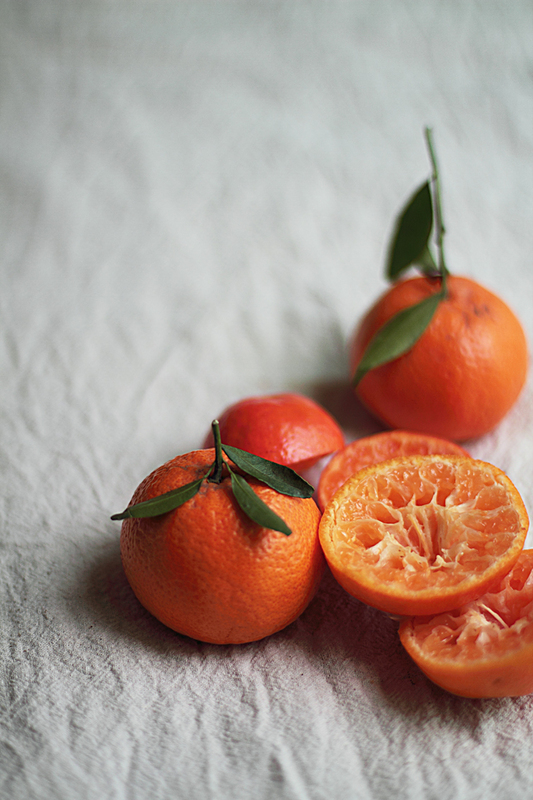 For the caramelized clementine, bring the sugar and water to a vigorous boil and drop the clementine slices in it. Let it boil in the water for couple of minutes and drain it. Place it on a baking tray, sprinkling a pinch of sugar and a dab of butter on each slice. Put it in a 240 C oven for 30 minutes, changing sides one time in between. Make sure you use a thin skinned clementine for this else the skin will be bitter to eat. Use to garnish the mousse. 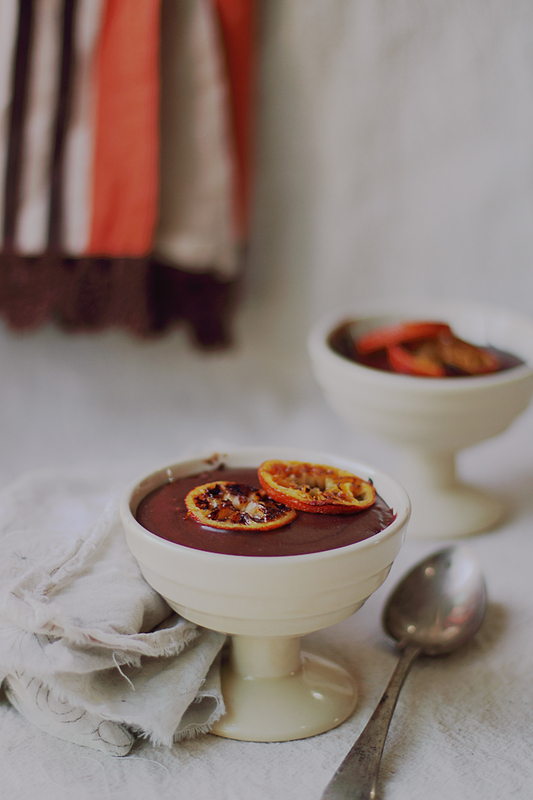 I always love to add a little citrus in all my chocolate dessert! I am not much of a sweet tooth person but this one .. I have to try. Looks stunning! What a glorious flavor combination! A delightful mousse! What a divine flavor. I love your clicks. Sounds wickedly delicious Kulsum and those gorgeous pictures tell its own tale. Of late, I can't take my eyes off your stunning photos. Makes me wish I had at least an ounce of your talent! Sure gone to try this one, love ya! sooo good! Chocolate+Orange = yummm!Do not have Clementines right now but going to get it on my next visit to the grocery store and making it soon! Thanks for the recipe! Always love to see your post! This mousse looks incredible! 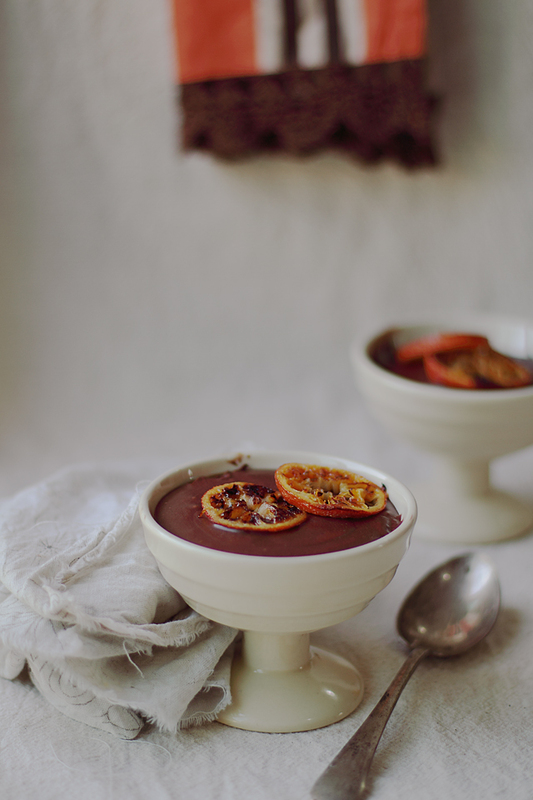 Chocolate and orange is always a winning combination in my book, and your chocolate clementine mousse looks quite simply amazing and oh so delicious!! I'd love some right now! I love the mousse and how glossy and rich it is. I have been tinkering with a sweet pistachio pesto recipe for a while now and this will compliment that beautifully. thanks for sharing girl! Such a glorious flavor combination and in one of my very favorite desserts :) Beautiful photos as well! Love citrus and chocolate! Made truffles with lime a while back and it was delicious together; will try a mousse with a caramelized clementine as I have one sitting in the fridge right now! Your technique for the mousse is so unusual, what no eggs? I can't wait to try it! Seductive is the first word that comes to mind... absolutely seductive. Yum! What a scrumptious recipe; such a delicious combination of flavors. Lovely shots too! WHat?! a mousse recipe without cream?! this sounds fantastic!